Meet Dave! 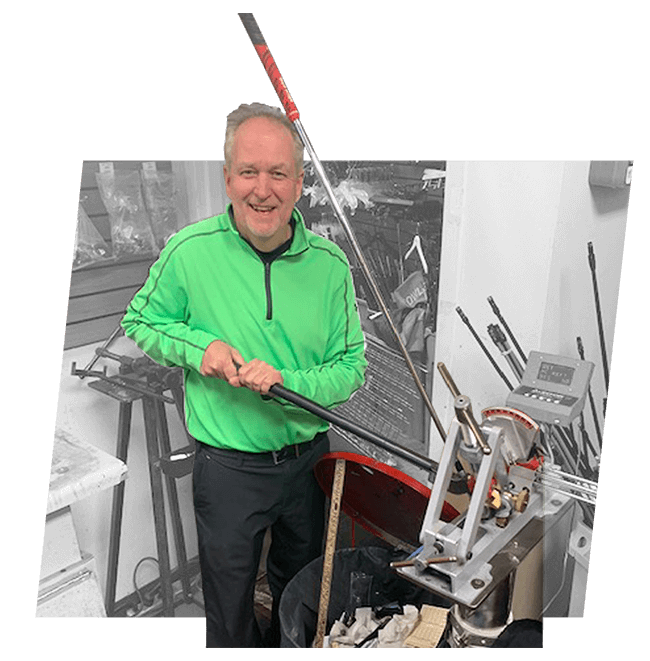 Dave (aka Davey) has been doing club repairs since 1986! That is a long time to perfect the art of club repair. Dave has seen it all when it comes to broken clubs to cut downs to lie adjustments. If you need work done on your clubs Dave is your guy! If you just so happen to live in the Madison area be sure to swing by and meet the club guru himself. If nothing else he is pretty entreating and you will be sure to have a laugh or two. Our repair shop is able to perform the following repairs in a timely order. Re griping – Buy what we have or bring you own! Can typically be completed while you wait depending on the time of season. Re shafting- We all know how it feels to have an injured club… Let us fix it! No matter the club from drivers to wedges we will do our best to replace your shaft with the same or similar shaft you had. Cut Downs/Extensions– Golf’s a game of inches and not just when it comes to putting! Shaft length is crucial to having a good swing plane. Come and get measured up today to see if your clubs are fit for you! Loft and Lie adjustments– Depending on how tall/short you are and how you set up to the ball you should have your lies adjusted for your swing! It is all about making the game easier isn’t it? And why not use state of the art digital equipment to improve your game? Loose head? Sound like gravel is in your shaft? loose grip? Broken Ferrule? Bring in your club/s so we can get it fixed and you back on the course! We do live in Wisconsin after all… We only have so many months to play the game we love! Do not waste a day with a club that’s not in performance condition.